My goal as a pediatrician is to provide patients a place they can call their medical home. To me, a medical home is a clinic where patients and their families are known and recognized, always feel respected, and are treated with the most up-to-date medical care. My passion is promoting the health of children in order to give the kids of Oregon and Southwest Washington a great start in life. For me, the ideal way to accomplish this is through regular, family-centered visits in a caring and approachable environment." Dr. Sari obtained a B.S. in Biology and a B.A. in History from Gonzaga University in Spokane, Washington in 2003. From there, she traveled to Omaha, Nebraska to earn her M.D. at Creighton University School of Medicine. 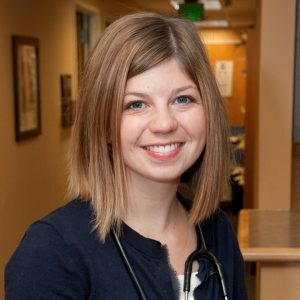 She finished her education in pediatrics back in the Northwest at Oregon Health & Science University in 2010. "Dr. Stephanie Sari is both of our girls' doctor and we absolutely love her and would highly recommend her to all of our family/friends! She always cares about our concerns and asks us what we had questions about our daughters health or whatever else we needed to talk about. She really takes time to get to know you as the parent, but the child(ren) as well and that really means something to both me and my husband. Even more of a plus that our oldest daughter just adores her too! We loved her so much that she is our youngest daughters doctor as well. It's nice that she can see the both of our girls from newborn, until now. The office staff is amazing as well. They all just care so much. Thank you for the wonderful work you all do at Gresham Metropolitan Pediatrics! My husband and myself plan on keeping Dr. Stephanie Sari as our daughters doctor until they are of age to move to another doctors office!" "I trust Doctor Sari with my child's health 100% .She is not only a good pediatrician she is a great person. I highly recommend her." "I could not be more more thrilled with the great care my 3 kids get from Dr Stephanie and the staff at metropolitan Pediatrics. Dr Stephanie is so great with kids and empathetic to their needs and consents. She very kind and thorough with her exams and takes the time to address all concerns. At my daughters 2 week post birth appointment Dr. Stephanie noticed a small almost peach fuzz patch of hair at the base of her spine, she recommended we do some testing just to check for spinabifida or tethered cord, just to be on the safe side. It turned out she did have a tethered cord and had surgery to correct at 8 months old. When telling the surgeon and nurses the story of how it was found and so early they all responded with praise "Great Dr! For catching it so early!" I feel very blessed to have such a great pediatrician who seems to truly love what she does and her patients."